In order to be a successful Poker player you need to have an arsenal full of weapons, these weapons are the different types of bet you can make. One important note before we begin, Before the flop we discussed bet size as a multiple of the Big Blind, so we might say “Raise 3 times the big blind”. After the Flop we discuss bet size as a multiple of the current pot size, so we might say “Bet ½ the pot size” so if the current pot size before your action was $20 you would make a bet of $10. Let’s take a look at the six fundamental types of bet which you will be able to apply in your strategy. A Value bet is where we believe that we have the best hand, and we want to get increase the size of the pot that we are about to win. The problem we face here is, we want to get as much money into the pot as we can, but we also don’t want to bet too much that our opponent gets scared off and folds. So we are trying to find the maximum bet that we can make that our opponent will call. Betting ½ the size of the pot is only giving your opponent Pot Odds of 3 to 1 so if an opponent on a drawing hand calls then he would be making a mistake as he wouldn’t have the odds to chase most drawing hands. A Continuation bet is used only when we took the lead in the betting before the flop by making a raise. The flop comes down and completely misses our hand. So were now sitting there with a hand that has missed the flop, however we have already shown strength to our opponents and they don’t know that we have missed the flop. We have the option here of making a Continuation bet, where we maintain the perception of strength that we have given our opponents before the flop. What were hoping to do here is pick up the pot right here without any further action. The chances are that our opponents have also missed the flop, and this show of strength before the flop followed by a continuation of that perception of strength after the flop may force your opponent to fold. You’re not committing too many chips to the pot, so if your opponent has actually hit something and calls or raises your bet you can still get away from the hand without too much damage. You’re only giving your opponent Pot Odds of 3 to 1 which is not great odds for him to play on with most drawing hands. So if your opponent has also missed the flop the chances are a continuation bet will chase them out of the pot, if your opponent has hit something on the flop then you are able to get away from the hand without committing too many chips to the pot. A Probe bet is similar to a continuation bet but has a slight difference. In this situation your opponent has taken the lead in the betting before the flop and then after the flop he has not bet. Now this creates a problem for you because you are now getting mixed signals from your opponent, he has shown strength before the flop, and now has shown weakness after the flop. So we need to decide whether the weakness our opponent has shown is genuine or whether it is a trap. To make this decision we use a Probe bet, which get it’s name from it’s objecting, we are probing for information from our opponent. This is a bet of about a third of the pot. We force our opponent to make a play so we can gain some information about our opponents hand to help us assess what our opponent is up to. If we were not to make a probe bet at this point not only would we lose the chance to take the pot there and then, but we would also go into the Turn card having little idea of what our opponent is holding. The slow play is a very powerful manoeuvre which can be used to extract additional chips out of an opponent who wouldn’t normally commit that many chips to a particular pot. As effective as the slow play move can be, it does have increased risk as it gives your opponent a chance to catch up and overtake your hand. It is for this reason that we should only use this play with strong hands and only in certain situations. The slow play basically works by acting weak in the hope of hiding the strength of your hand. Hopefully, this will then induce a bluff or at least a misinformed bet from your opponent and get him to commit chips to the pot, that he wouldn’t of otherwise committed. Your Hand Q J – Flop comes down 8 9 T , you’ve just flopped a straight! However a good opponent should spot that there is a straight possibility on the flop and may be cautious. If you were to lead in and make a value bet of half of the pot, the chances are that your opponent may wonder if you have the straight and maybe fold. If you slow play this hand and check, your opponent may think that you are scared of someone holding a straight, and try to represent that he has it by making a bet hoping that you will fold and he can take the pot there and then. You then have the option to either raise him (and reveal your strength) or just call and continue the slow play into the next round of betting. By making this move you have got your opponent to commit chips to the pot and increased the size of the pot in a situation where you have a very strong hand. Now the risk with the slow play move is that you give your opponent the chance to catch up, and also run the risk of giving your opponent a free card if he fails to bet and also checks. This is why you should reserve this play for only the stronger hands, and never slow play if you think your opponent could be on a draw which would catch up with or beat your hand. Slow play can also be used against a very tight opponent, where by you give him free cards in the hope that he might catch up a little (but not overtake) your hand, thus encouraging him to bet. An overbet is just as it sounds, it’s where you make an oversized bet in order to put maximum pressure on your opponent in the hope that he makes a bad decision. In a bluff attempt – we are trying to take the pot and want to make it very expensive for our opponent to try and call out our bluff – in this situation we may be able to force out opponents who are only holding marginal hands. In an attempt to build up the pot – if we are playing a particularly loose player or we have recently attempted a number of bluffs which our opponents have seen we may overbet the pot in the hope of getting a call – Our opponents may call thinking we are attempting another bluff. This is the maximum bet you can make and hence gives your opponent a very tricky dilemma. It’s very similar to an Overbet but it is a more risky move due to the amount of chips you are committing to the pot and should only be used in certain situations. You should always be aware if you are Pot Committed in a particular hand. 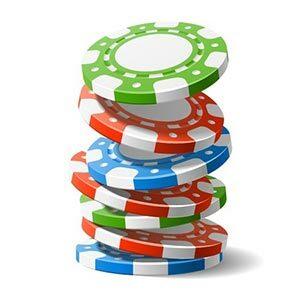 Being pot committed means that you have so many chips already committed into the pot compared to your remaining balance that you can’t really fold to any bet. In this situation it is always better to make the first move and go All-In rather than letting your opponent make a bet that puts you all in. Whys this? Because if you make the first move you have an additional way to win the pot, as you might force your opponent to fold, where as if you just call his bet putting you all in, you will have to beat him to win the pot. The All-In bet is used a lot more in Tournaments rather than Cash games, so at the moment this bet should have very limited use in your strategy. To finish off this lesson there are just a few more points I would like to mention. Although I have given you approximate bet size guidelines in each of the bet types above it is important that once you are comfortable with using the above bets you start to vary the amounts of the bets. This doesn’t have to be drastic changes, but if you always bet the same amount then once you start playing against better players they will start to read you like a book from your betting patterns, and you need to keep them guessing, and make it hard to read what hand you have, and what type of bet your are placing, otherwise it is very easy for them to counter your actions. Now that you understand the different bet types, you can start to try to spot these types of bets in your opponents actions. this is called betting patterns and is part of the process of trying to gain information on what hand your opponent might have and what he is trying to do with his actions. Fish don’t have a strategy! Although you now have an arsenal full of well thought out bets, you have to bear in mind that Fish won’t have a strategy and won’t understand Pot Odds etc and so some of the more complicated bets above won’t work as effectively against weak players. Against weak players you should play a very basic betting strategy with plenty of value bets when you have a good hand. Once we move onto playing better players at higher stakes we can use these more advanced bets against them. Use this exercise to introduce some of the bet types you have learnt and continue to play according to the strategy you have learnt and don’t vary from it, continue to use your starting hand chart and all the other tools you have in your strategy.